At Lindy Bout, we celebrate the spirit of Lindy Hop by throwing down on the dance floor and affirming the kinship and solidarity of our community through African-American vernacular jazz dance. The Lindy Bout event directors hope to create a supportive competition environment animated by the music that is inspiring to competitors and spectators alike. The following rules apply to all matches at Lindy Bout XIII. Be sure to read match descriptions carefully for additional rules and descriptions specific to that match. The Lindy Bout Event Directors are the organizers of this event. Final decisions on all matters pertaining to the matches rest solely with the organizers. The Lindy Bout organizers reserve the right to rearrange the schedule and match formats. Any changes will be noted on this website if they occur before Lindy Bout XIII, or will be announced by the emcee if they occur during the event. All competitors must hold an Event Pass for Lindy Bout XIII. Participants dropping in for part of the event or holding a Dance-Only Pass are not eligible to compete. Competitors must have paid all match fees and signed the LBXIII waiver prior to competing. Your spot in a match is not secured until we have received full payment. Match fees are non-transferable. Match fees are refundable until February 28, 2019. Starting March 1, 2019 match fees are non-refundable. Except for the Mapleweight team battle, Finalists and Champions will be determined using relative placement. Preliminary rounds will be danced in an all-skate format. Final rounds will be danced in a combined all-skate and spotlight format to a live band. Exceptions to this are the Mapleweight, Interregional, and All that Jazz matches. Please see the specific match descriptions for details. Cash prizes and/or event passes will be awarded to the Champions; the amount of prize money awarded is proportional to the number of competitors in each match. 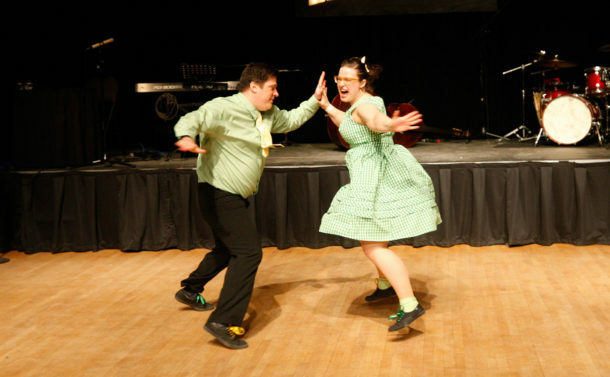 Unless otherwise stated, Lindy Bout matches are primarily Lindy Hop competitions. So, competitors should dance Lindy Hop and other African-American vernacular jazz dances, as inspired by the music. Dancing combines musicality, quality of movement, technique, and partnership (if dancing with another person). Lindy Bout judges are looking for all of these things — plus that special pizzazz that makes competitors stand out on the dance floor. In the choreography matches, dancers will additionally be judged on the creativity of their choreography, and the quality of their performance. Decorative, colourful, and/or vintage attire is not mandatory, but it greatly enhances the way you look while you are competing, and we strongly encourage it.